The first time I ate a kapsalon I thought I was eating a dish that originated in Turkey or Greece. I was wrong about that. Every time I walked past a hairdresser’s shop and saw the word “Kapsalon” above the door I wondered if the two words were spelt the same of just looked similar. They are spelt the same and there is a good reason. I’ve heard a couple of different versions of the story, but both versions agree on one thing: kapsalon was invented by a hairdresser in Rotterdam. 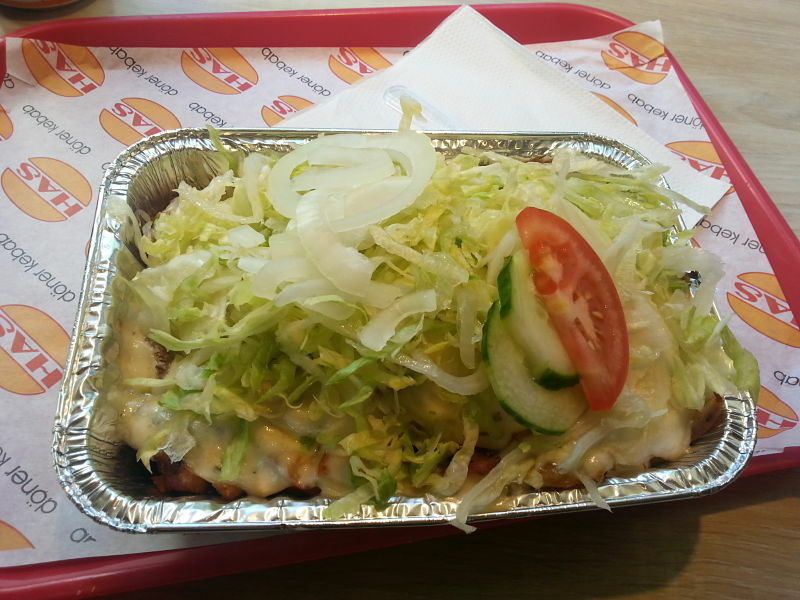 Kapsalon is a Dutch dish that is usually served in a tinfoil tray. You can buy it at nearly all of the donner kebab shops and most of them offer a choice of three sizes. Chips are the first thing to go into the tray and they are covered with donner kebab meat, followed by some Gouda cheese. The tray goes under the grill until the cheese starts to melt. Then it is pulled out and topped with salad. It’s optional, but a lot of people add garlic sauce and/or hot sauce. A single serving contains around 1200-1800 calories. That might not sound like a lot, but the average man only needs 2,500 calories a day to maintain his present weight. The average woman needs just 200 calories per day, so kapsalon is probably a poor choice for anybody who is trying to lose weight. But . . . it tastes so goooood! Kapsalon was created in 2003 by a hairdresser called Nathaniël Gomes, with a little help from the guy who owned shawarma store next door to his salon. Some people have told me Gomes wanted to combine all of his favourite foods in a single dish that would keep him going when he had to work late at his shop. Others say he created it to eat in the middle of the day. The second version seems more likely to me.